Small but mighty, the YETI Roadie is the best personal cooler you’ll ever find to protect your lunch from the ravages of sandwich-soggifying, drink-sweating heat. 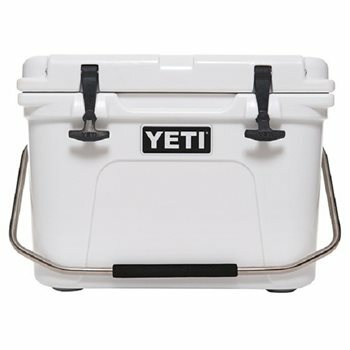 Built with the same hardy one-piece construction and ice-retaining insulation as our Tundra ice chests, this small personal cooler is equipped with a heavy-duty stainless steel handle for better portability. The Roadie is even grizzly proof, just like its larger Tundra cousins. Take this sturdy little portable cooler with you to the job site, or play hooky and head down to your favorite fishing hole. It’s also right at home in a campsite, kayak, canoe, ATV or golf cart. Hitting up a BYOB party, barbecue or restaurant? The small Roadie cooler is the ideal size to BYOB, and the No Sweat Design prevents any embarrassing messes. The unbreakable, self-stopping hinges keep the lid propped open while you fish around for the perfect pairing. What beer goes best with venison sausage?